Many parents want to be close to their newborn child, especially at such a delicate and fragile stage and this is why the Co-sleeper bassinets have been designed. They are designed smaller than the average crib and offer a more snug fit, which allows for close contact during the night, usually at arms reach. They are often placed next to the parent’s bed to ensure easy access in the middle of the night, which helps with getting both parent and child back to sleep after feeding. There are many individual designs with unique features like mobility for example and can be a handy companion on the go. Overall Safety – Make sure to follow the clear instructions and overall safety guidelines with setting up the Co-Bassinet, which will be needed in some cases. Other issues are more grave and awful, like the Sleep-related deaths that sometimes happen and by following some guidance on how to prevent this will save a life. Materials, Mesh, and Walls – Most Co Bassinets are designed with child-safe mesh, but making sure is always important and check with the manual or the seller’s product description. Breathing can be difficult if they find themselves pressed against the meshed walled materials at the side, so have one that is breathable will be essential. Type of Mattress Thin or Firm – Some offer slightly better comfort than others and making sure you get ASTM approved one will make for a certain buy and a good nights sleep for your newborn child. Some words of warning are that some MDF woods are being used as a base for the Co bassinet and these can emit subtle formaldehyde, although very low levels if your child is particularly sensitive to chemicals that most others are not then it might be worth noting. 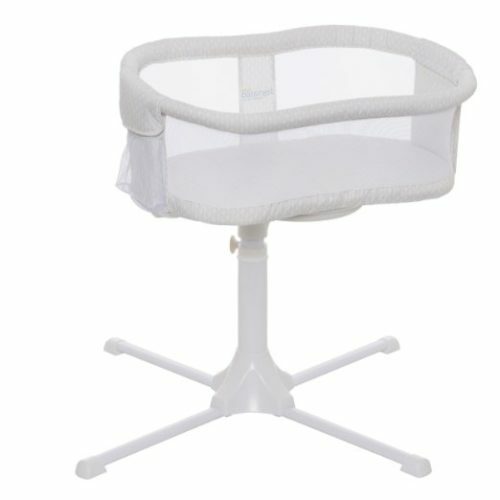 Easy to Clean Materials – The easier to clean the better chance for hygiene and finding a Co bassinet that offers removable materials are great for maintaining high standards of cleanliness. Size and Weight – Getting the right weight and size is crucial when deciding and if you intend to move your bassinet from one room to another several time a day then making sure it’s light to pick-up is a good idea. How Easy to Transport and Overall Portability – This can often be a trade-off between features and portability and finding the one that strikes the balance can be difficult, especially when you want both, so make sure you know what is more important to you. Eye Appeal – These are sometimes coming with you everywhere from different rooms in the house all the way to the extended families, so make sure you get one you like the look of and matches the decor. How easy to Use – Some are just easier than others and get one that has wheels for example and can be rolled from room to room is a good idea for those with C-sections for example. Sound and Movement – Some of the new and latest features are the ability to play lullabies and you might like this soothing aspect it has on your child. Storing Toys – Some have heaps of space to store toys and blankets, bottles and well pretty much everything you’ll need in those early stages. Bassinets are for a specific period and most mothers agree that’s for the first 6 months. The time to be aware of is when they can lift up onto their hands and start sitting up, that’s the time for them to move on to a crib or something bigger. The Bassinet is designed for newborns and has a weight restriction, so it’s highly advisable not to use after the suggested period, but for assurance always check the manufacturing guidelines as they differ from brand to brand. Have or plan to have a C-section, so need to be close without the stretching that would naturally happen otherwise. We have looked into loads of reviews and comments, heard the stories about each, looked at the price range for each type and filtered the best of the bunch and on top this, we personally did our own research to find out which was the best. We looked at the functionality of the bassinets for storing diapers, wipes and other necessary items that make using the bassinet easy. Some can be used as a changing table and feature of the best attachment bassinets that are currently available on the market. The movement of some bassinets are great for handling and moving from one room to the other without disturbing the sleeping baby, which is also ideal for moms that spend time in different rooms throughout the day. Portability is crucial for some families and this can be found in several of the reviewed bassinets. Some bassinets offer sound effects and soothing vibration motions that can help ease an uneasy newborn that needs reassuring. These suit some babies and not others, but this can help mothers who are finding it difficult getting their child to stay down for a prolonged length of time. 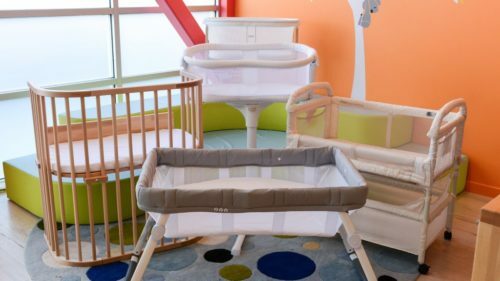 Some parents ask why not a crib instead of a co bassinet and it is simply down to your child’s circumstances, but there are some important differences to note. Size is an important factor and for those mothers eager to buy and not figure out the dimensions of the room, might have a problem. 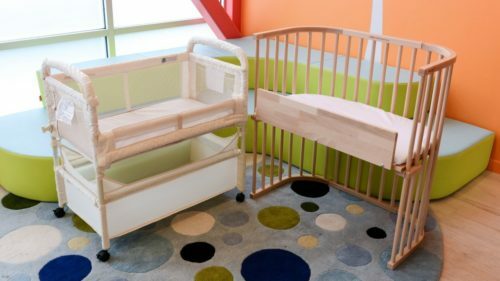 Co bassinets sides are usually much lower and easier for access, which is important for moms in certain circumstances, like C-sections for example, which makes leaning over and bending less stressful on the recovery. This co-sleeper bassinet is a different type of newborn bed with a safe attachment to the parent’s bed, which ensures quick access and monitoring. I like this feature and in comparison, it feels safer, especially at the later stages when a baby starts to push themselves up. The co bassinet offers a whole load of storage capacity and makes accessing toys, bottles, and essentials extremely easy and convenient for the parent. This option isn’t available with the last one in this review and for those homes with limited space, it’s worth dwelling over. 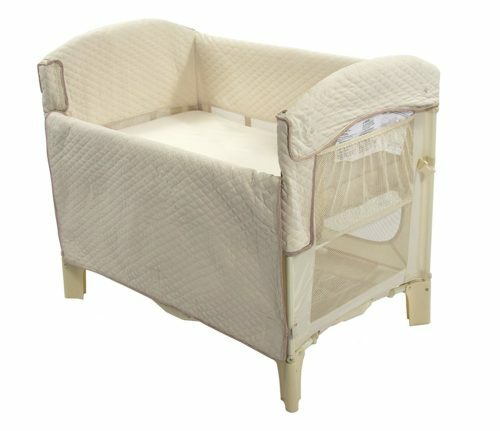 The baby bassinet comes with a mattress, which is firm and comfy, ideal for the early infant stages because too soft isn’t ideal for their already soft structure. The baby co-sleeper has breathable mesh on all sides and shows that safety is paramount in design. This is a unique feature in comparison to some, but throughout this review, I have chosen ones with breathable mesh and material. Some mothers will have gone through a C-section and with this, in mind, the co bassinet here seems to suit ideally and offers a limitation for the need to stretch too far at any moment, but instead, by simply an easy arm adjustment the child can be tucked in and looked after. This co bassinet is the first in this review to be able to be used as both, sleeper and a changing table. This unique design is ideal for parents who want a specific space to be able to be used for multiple purposes and offers a reduction of other devices needed. This baby bassinet attaches to the bed and offers early infant needs right up until they are toddlers and reduces the need to buy separate goods over the years, which will save money in the long run, it’s good for those long-term planning couples. The stunning design is functional and beautiful, with great fabrics throughout and meshed sides for safety. The material is easy to clean and maintain and will last the test of time. Those wondering how to go from sleeper to changes it’s really easy, just simply push and lifts for the changeover, if only a diaper was changed as easily. Some baby bassinets offer overhead amusement and this has a removable bar for adding to your child’s amusement and ensures they get an overhead giggle. This side sleeper baby bassinet is more expensive than some of the cheaper option and for some, it won’t be feasible, but for those who can it really can offer some additional benefits for you and your child. This is a fantastic bassinet and one of the cheapest in this review, it has an easy to use design and will make setting things up extremely simple. One of the main features is the rocking motion, which is available with a push of a button and will ensure your baby gets off to sleep very easily. This will assist some who need additional assurance and make sure bedtime or nap-time is smooth. The auto-rock comes with an adoption cable and will need to be plugged into the wall outlet to keep rocking. The device has 12 songs of sweet melodies and 3 sound effects that’ll assist in easy transitioning to sleeping, which is a co bassinet main purpose. This feature is one of the few that do in this review and for this reason, it is worth considering, but especially because of the low-end price as well. 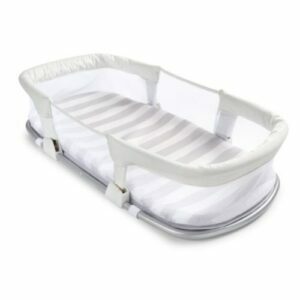 This newborn bassinet is the cheapest out of all and is a great bargain if you want an easy to use, easy to transport and easy on the bank balance. The rocking bassinet mobility and compact design makes it easy to transport anywhere and will be easily hidden out of sight if you want to make space at certain times, which is ideal in comparison to some others which have no such feature. The breathable seat and cover make for a safe and comfortable co bassinet. The padding can be washed in the washing machine and for those parents wanting a clean, fresh bedding all the time then this is a fantastic choice. This is a Moses-styled co bassinet and offers a great option if the price range is restricted and you want a great deal for a small price. The mobility aspect is fantastic with this portable bassinet and can be used in almost any circumstances, which is handy because I’m guessing all the family is screaming for you to come visit. The long and flat design makes for placing anywhere possible and very convenient for journeys away to visit friends and family, especially that mom and dad of yours always on the phone and face-time. The material is 100% polyester and is easy to wipe down if any milk is split, but one notable thing is, sometimes the smell can be a little strong, so some mothers recommend a blanket over to reduce the unpleasantness, but there is no known health risk associated with the mild odor. The bassinet is very stable and well built, so for those mothers wishing to place in the bed whilst sleeping, it is possible, which sometimes helps in the initial transition. This best in bed co-sleeper should only be used until the child is starting to push themselves up because then it is time to think about a co-sleeper crib. 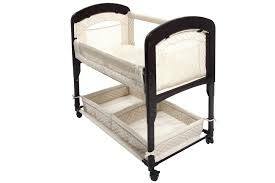 The rotation on the bassinet co-sleeper here is amazing and makes access your child extremely easy when needed. The swivel can rotate a full 360° and when in alignment with your needs the locking mechanism will ensure this remains in position until changed, which is unique in comparison to the others. The moms who went through a C-section will particularly like this bedside bassinet because the reduced stretching will make things easier for the healing process and will keep the connection as strong with the associated pain getting in the way of care for your child. The fitted sheets are polyester and can easily be wiped when needed, just a simple cloth is ideal and when it is time for a wash the sheet can be thrown in the washing machine. The easy to reach storage is great for the bare essentials but doesn’t have large storing capacity unlike some compared earlier. The recommended is up to five months of age and as soon as the infant is showing the signs of pulling up, kneeling and rolling over, then it is time for alternative options. The mattress is made from polyurethane, it is waterproof and JPMA certified, which can keep you satisfied it is safe and sound. 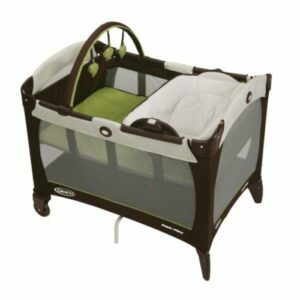 The best baby bedside sleeper, in my opinion, has to be the “Graco Reversible Bassinet”, which offers some neat easy to access features which none have with it being ideal for mothers with C-sections and snug to the bed swivel feature, which makes far less handling required, but yet still maintains the close proximity and care. The “Fisher-Price Newborn Bassinet” is one of the cheapest in the range of infant sleepers and offers great value for money. The easy to use, easy to clean and easy to transport design is unique, especially with its musical capability and for some kids, the lullabies will prove a hit.